Are feminized seeds guaranteed to become female plants? Due to progressive feminizing and breeding techniques our seeds are 100% stable so plants grown from feminized HortiLab Seeds are genetically female. Therefore don’t worry about the often heard arguments regarding hermaphrodites. See all feminized HortiLab Seeds. What percentage of your Regular Seeds will become female plants? Usually our regular seeds have a female/male ratio of 50:50. See all regular HortiLab Seeds. Usually 90–100% of the seeds in each pack should germinate as long as a recommended germination method is used. It can happen very rarely that some seeds do not germinate. In this case please contact our Customer Support. How long can i store your Seeds? HortiLab Seeds should have a lifespan of at least two years if stored correctly. This doesn’t mean that our seeds won’t germinate after two years, but the germination rate will begin to get lower. What's the best way to store Seeds? Seeds should always be stored dry, dark and cool (4º C if possible). Therefore the refrigerator (NOT the freezer) is an appropriate place to store Seeds. 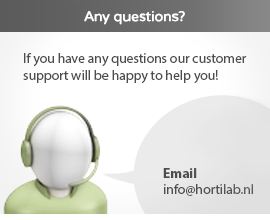 If there are any questions left don’t hesitate to check out our awesome Customer Support by phone +31 202 330 038 or email support@hortilab.nl.